Mindi, a shy FIV-positive cat, was constantly passed over by visitors to the Cat Depot in Sarasota, FL. So when the shelter was accepted into the Jackson Galaxy Foundation Cat Pawsitive clicker training program earlier this year, the staff immediately enrolled Mindi. She’d been living at the shelter for nine months and after just two months of clicker training was placed into a loving home. 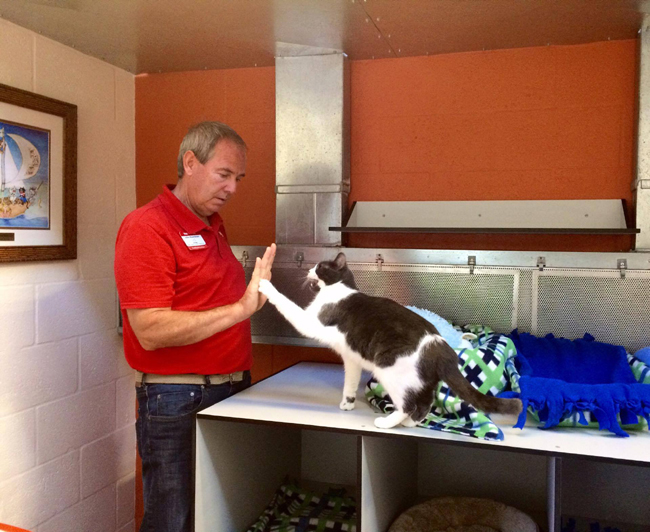 Mindi gives a high five during a clicker training session at Cat Depot. 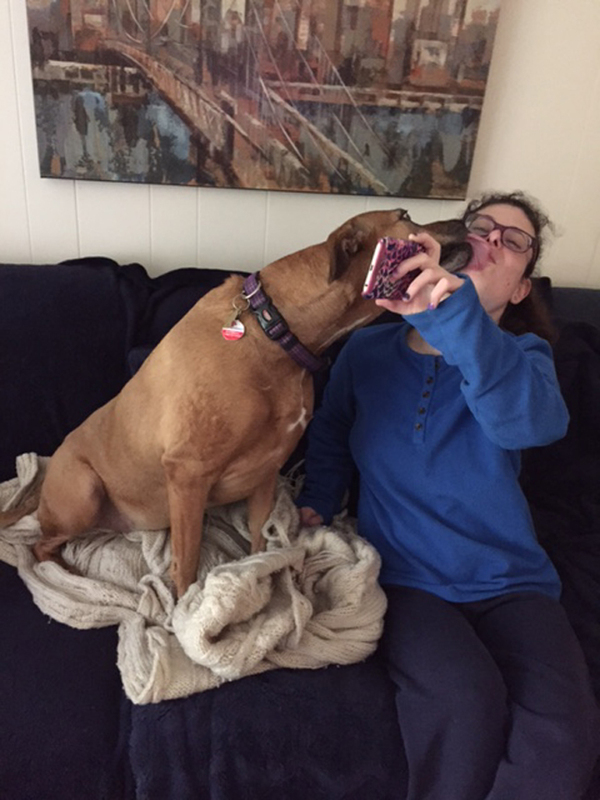 Her new family is continuing this training to provide Mindi with positive reinforcement. The Jackson Galaxy Foundation created the Cat Pawsitive program in 2016 to help shelter cats overcome the stress associated with shelter environments. Shelters apply for enrollment into the three-month training program, which includes training webinars and consultations with feline behavior experts. The Cat Depot has been using clicker training informally for four or five years but with the launch of the Cat Pawsitive program, clicker training became part of daily life at the shelter. With the focus on hard-to-adopt cats, training sessions are conducted twice a day, five days a week. Of the nine cats enrolled in the program during the formal training session, eight have found homes. Is it Fair or Healthy to Carry Small Dogs All the Time? My friend Joy sent me a photo of her 7-pound mini dachshund, Rosalie, hanging out in a front dog carrier. Rosalie is usually running or playing in her yard with her doggie siblings or walking on the beach with mom. 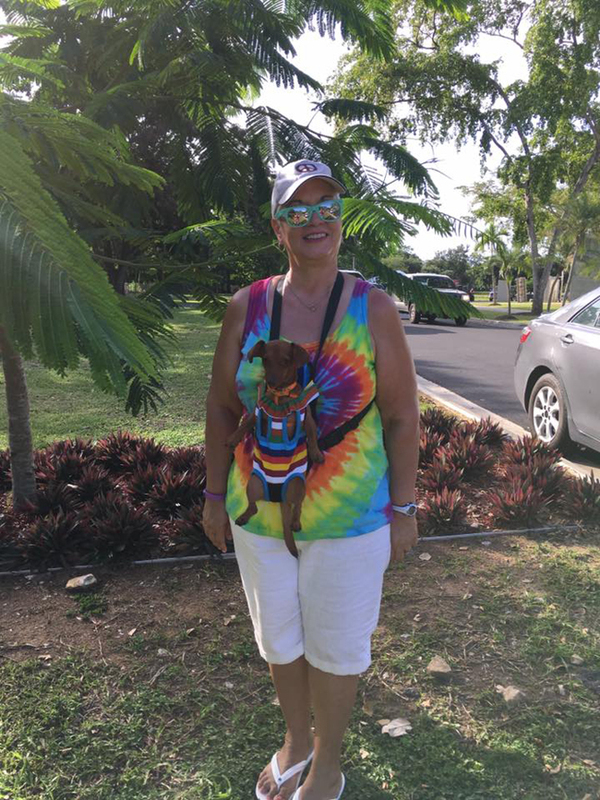 On this day she was in the carrier for her safety because the family was hanging out at the Purina Woofstock event in San Juan, PR, where they were surrounded by people and large dogs. Trainers say there are definitely times when small dogs need to be picked up and carried for their protection. For example when around large crowds of people or dogs, at gatherings when there are lots of children who could unintentionally hurt the dog, on long hikes or walks when a little dog might not have the stamina to go the full distance and when visiting stores or malls that allow small dogs. Mini Dachshund, Rosalie, safely tucked inside a carrier at the Purina Woofstock event in San Juan, PR. At home, Rosalie enjoys running and playing in the yard with her siblings. Problems occur, according to trainers, when owners start treating their small dogs like babies and carry them everywhere. This post first appeared on Care2.com. 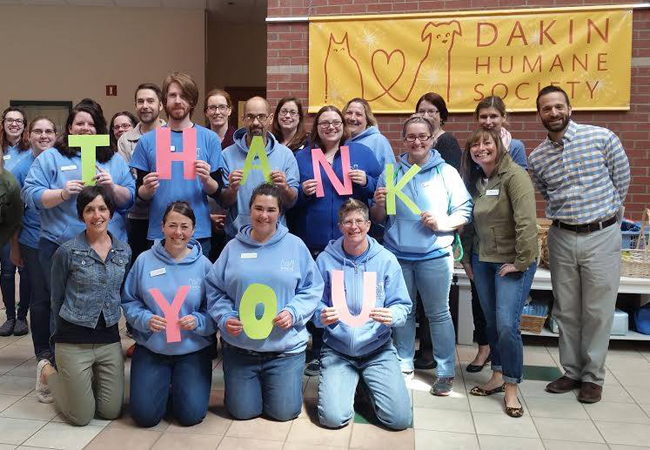 Dakin Humane Society adapted an Open Adoption policy more than six years ago. Certified Humane Educator Doriane Lucia has fond memories of caring for pets in the classroom. In fact, she credits classroom fish and a caring fifth-grade teacher with fostering her love and compassion for animals. “This experience was huge for me. I didn’t know years later this would become my life’s mission, but even if it hadn’t, it would still have taught me responsibility,” said Lucia, who received her Master’s degree in Humane Education from Cambridge College in Boston, Mass. and The Institute for Humane Education, and is a member of the Association of Professional Humane Educators. When the Pet Care Trust began offering Pets in the Classroom grants in 2011, more than 500 teachers nationwide applied. Today, the grant program has issued close to 40,000 grants with an average of 50 students being impacted per grant. The grants are offered to public school, kindergarten through sixth-grade classes, and are intended to support pets or aquariums in the classroom. 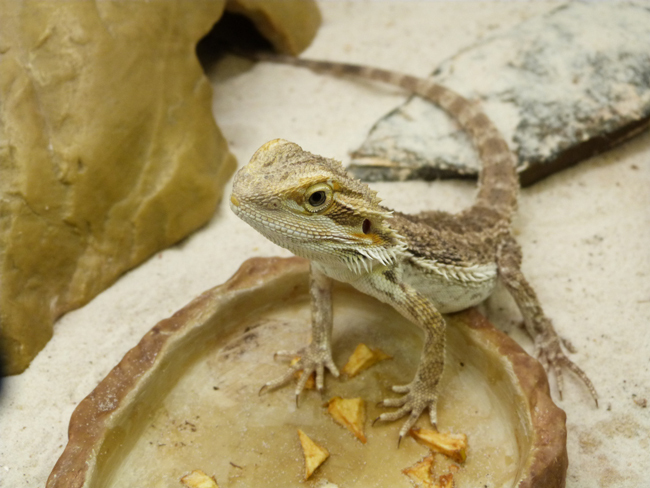 Bearded dragons made the list of popular classroom pets in an American Humane Association study. Brook, a Rhodesian Ridgeback mix, was sitting in a high-kill shelter in Arizona with just two days to live when she was rescued by Janice Wolfe, founder, and CEO of Merlin’s Kids. The nonprofit organization rescues, rehabilitates, and trains shelter dogs to work as service dogs for children with autism and special needs, as well as to assist disabled veterans. After extensive training Brook returned Wolfe’s kindness by transforming the life of Julie, 21, who is developmentally delayed due to a premature birth. Twenty-six years ago the definition of feral cats wasn’t part of the national consciousness in the United States. Today, hundreds of nonprofit organizations across the country are managing feral cat colonies using the Trap-Neuter-Return (TNR) method of control. Among them is Donna Moussa who runs the TNR program for Save the Animals Rescue Team II (STARTII) in Bergen County, NJ. Moussa got involved with the program after following a mother cat and her kitten into a neighbor’s backyard where she discovered more than 40 ferals lounging around the pool and hanging out in flower pots. 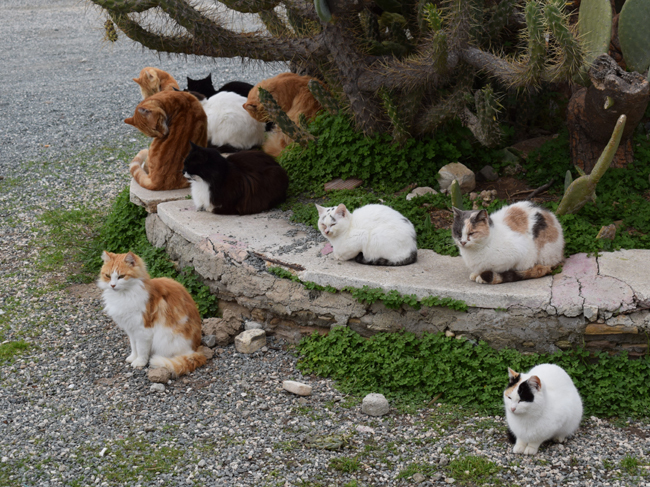 Twelve years later Moussa and her team have trapped more than 3,000 feral cats, transported them to the spay/neuter clinic, and cared for them during recovery before returning them to their colonies. Feral cat advocates nationwide hail this method as the most humane way of managing colonies. According to numerous scientific studies—many conducted while monitoring feral cat colonies on college campuses—TNR improves the lives of cats, improves the relationship between feral cats and the people who live near them and over time decreases the number of cats in a colony. 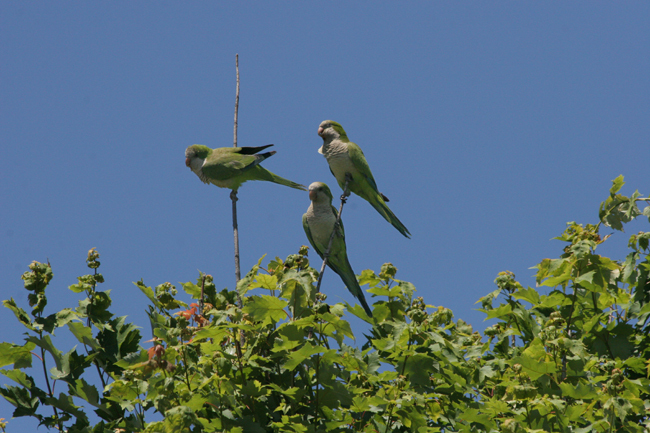 This blog first appeared on Care2.com. When walking around suburban neighborhoods in upstate, NY, I am struck at just how many dogs are confined by invisible fences. There are many reasons dog owners choose to install electronic fences. For some it’s a financial decision—electronic fences tend to be a cheaper option. In other cases, homeowners associations or neighbors prohibit the installation of physical fencing. Whatever the reasons, dog owners install the fencing because they want their dogs to have the freedom to run and play in their yards. Since positive motivation training and behavioral experts say it’s impossible to predict how any dog will react to electronic confinement, I wonder why so many families are willing to take a chance on their dog’s wellbeing. Positive Motivation Trainer Jenn Michaelis, the owner of SassyT Canine Academy in Westchester County, NY, believes that there is not enough information available about the negative impacts of electronic fencing on dogs. She discourages her clients from using electronic fencing and is happy to discuss alternatives with them. Sara Reusche, who is also a positive motivation trainer, and owner of Paws Abilities Dog Training, LLC in Rochester County, MN, also steers her clients away from invisible fencing. Both trainers above help rehabilitate dogs who have been negatively impacted by electronic fences. In fact, Reusche said that “…sadly these cases make up a sizable chunk of her business.” And in most instances, the owners never connect their dogs’ out-of-the-ordinary behavioral problems with the recently-installed electronic fences. 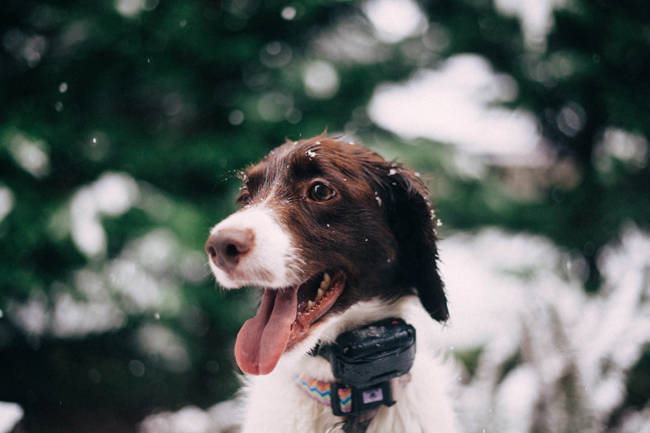 Some of these behavioral issues include dogs who have accidents in the house because they are terrified to go outside for fear of being shocked; dogs who are afraid to wear collars; previously friendly dogs who become aggressive toward people and other dogs; dogs who are afraid to go for walks and dogs who are afraid of any sound that resembles the warning beep on the shock collar. For example the beep from the microwave or the ping on a cell phone.